Can children be saved? Can children sin? 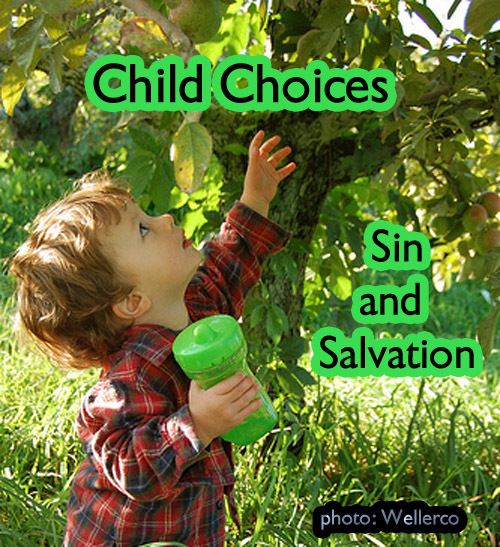 Does a child’s choice for Jesus save them into adulthood? We will look at what the Bible has to say about this important subject of child sin and salvation. It is also important to know that God does not hold us accountable for ANY “sins” that we committed as a child for there is no sin for children. Rom 5:13 For until the law sin was in the world: but sin is not imputed when there is no law. Sin has no power over us unless there is a law to transgress. It is impossible to convict someone of transgressing the law when there is no law; they will walk away innocent every time regardless of their actions. However, once the law is in place, that person is bound to keep that law. One transgression of the law makes man guilty and man will be tried according to the Law. Children are not under law because they have not a reached a point of mental maturity, a.k.a. the age of accountability, to truly understand right from wrong. If a small child kills someone, they are not tried and sentenced to be killed by lethal injection. No, it is considered an accident because they did not understand. If man has the common sense to see this, how much more would God. Infants and children are certainly innocent because they do not truly understand the Law. The same is also true of those that are mentally retarded. Rom 7:9 For I was alive without the law once : but when the commandment came, sin revived, and I died. Romans 4:15 Because the law worketh wrath: for where no law is, there is no transgression. Children are known universally for their innocence. Why are they innocent? Because they do not know right from wrong. Psalms 106:37-38 Yea, they sacrificed their sons and their daughters unto devils, (38) And shed innocent blood, even the blood of their sons and of their daughters, whom they sacrificed unto the idols of Canaan: and the land was polluted with blood. The Bible calls children innocent. They are not sinners in the sense that they are accountable for their sins. However, they do clearly have a sin-nature, propensity toward doing wrong, in their flesh. Yet, the flesh does not determine the spiritual state of a man, or child, for eternity. In other words, having a propensity toward sin in our flesh does not condemn us to hell. A man has to knowingly act on that sin nature for it to be sin that damns eternally. When is the age of accountability? It is different for every child, for each child grows spiritually and mentally at a different rate. However, Luke 2:42-49 implies around the age of 12 to be a likely time for when it happens for most children. Since the Law does not apply to a child, sin does not count against a child. So, can they be saved? No. From what would they be saved? They are not dead spiritually. They have committed no sin, legally speaking. They are alive unto God, therefore they do not need to be “saved.” They do not need to be “born-again” in the sense that they have to be raised from spiritual death, for they never died. According to John 3 men must be born again, but that is talking about people that are grown up. Nicodemus understood this for he said, “How can a man be born when he is old? (John 3:4)” It is not talking about children. Jesus said about children, we are all to be like them to enter into the Kingdom of Heaven. Matthew 18:1-4 At the same time came the disciples unto Jesus, saying, Who is the greatest in the kingdom of heaven? (2) And Jesus called a little child unto him, and set him in the midst of them, (3) And said, Verily I say unto you, Except ye be converted, and become as little children, ye shall not enter into the kingdom of heaven. (4) Whosoever therefore shall humble himself as this little child, the same is greatest in the kingdom of heaven. In what way are we to be like to children to enter in? Humble, for sure, but also clean, righteous, and innocent because all children are, spiritually speaking. We too are righteous and innocent if we are born-again. Notice the humility comment is related to being great in the Kingdom of Heaven, not the conversion. The conversion includes the righteousness that we must obtain through faith in Jesus if we sin after the age of accountability. Does a Child’s Choice to Accept Jesus Apply as Salvation into Adulthood? The answer to this question is really what I am really trying to explain. I have proven by Scripture that there is an age of accountability and that the sins of a child do not count against them before that age. So does their choice to accept Jesus as a child automatically mean they are born-again into adulthood? No. If it is true that sins do not count against a child because they do not truly understand right from wrong, then positive choices, like accepting Jesus, do not count into adulthood for the same reason. We are to have understanding when it comes to the things of God. Without understanding we cannot know the things given to us by God. It is clear that to make a choice you have to know what you are choosing. Therefore, any child that made a choice to be “born-again” as a child does not carry over into adulthood. When they grow mentally to the point that they understand their sin and salvation, they need to choose Jesus again or be lost. The Bible says all have sinned (Rom. 3:23) and the wages of sin is spiritual death (Rom. 6:23). Since the sins of a child do not count, then the phrase “all have sinned” is referring to every single person past the age of accountability. Therefore, they must all be born-again once they sin knowingly…and all have. This is why teenagers turn rebellious almost suddenly. That is the moment they died spiritually. So if you grew up in church and accepted Jesus as a child, like I did at age 6, then it does not count once you get past the age of accountability and know right from wrong. You die spiritually the moment you sin after knowing right from wrong just like Adam did in the garden. I died spiritually and would have went to the Lake of Fire for eternity if I had died as a teenager before accepting Christ knowingly. I urge you, do not be careless about this subject concerning your teenager. Even if they seem normal now, you must instruct them that the need to accept Jesus Christ as savior from their sins once they understand right from wrong. They also must make Jesus their Lord. However, there will be nothing that tells them they have reached the age of accountability. Therefore, they must be instructed, preferably their entire childhood, to seek after God and stay repentant toward sins. Can a child be saved? No, because a child is not lost in the first place. They are alive spiritually from conception until they knowingly sin after the age of accountability. They do have a sin nature, propensity toward sin, however we are not guilty for having a sin nature. We only become guilty when we act on the sin nature fully knowing what we are doing. A child does not know what he or she is doing fully before the age of accountability. Does a child accepting Jesus become born-again? No, because they are not spiritually dead. They do not need to be born-again until after they knowingly sin. However, they should be taught to seek and follow Jesus every single day! This prepares them for the moment they knowingly sin and die spiritually. At that point, they MUST be born again! A child can be brought up in church and a Christian home, love Jesus everyday, and even be filled with the Holy Spirit. But the moment they sin past the age of accountability, they are lost. Their choice for “salvation” as a child does not count, just like their sin does not count, because they did not make the choice fully knowing what they were doing. Just like the age of accountability does not count a child’s choices to sin against them, it does not count a child’s choice for Jesus either. Once the child reaches the age of accountability and they knowingly sin, just like Adam, they die spiritually. They are eternally separated from God. If they were to physically die in this state, they would go to Hell. THEY MUST BE BORN AGAIN! They must knowingly accept Jesus Christ as Savior and Lord. As the Bible says, we all have sinned and come short of the glory of God and the wages of sin is (spiritual) death. Therefore, never teach a child that their choices as a child, for Jesus, carry forward into adult life. They do not. They, like us all, must be born again after they know right from wrong and sin.